The Bluefield Blue Jays begin their playoffs tonight against their division rivals, the Pulaski Mariners. The teams finished their seasons just a half-game apart with Pulaski taking home field advantage with a 41-27 record (the Blue Jays were just one win back at 40-27). While both teams swooned down the stretch, the Blue Jays only won three games in their last two weeks and have seen several of the players who were instrumental in a strong season get promoted off the team. These players included pitchers Tom Robson and Shane Dawson and shortstop Dawel Lugo. There was already a lot of pitching depth on the club already and more than enough to be competitive in a short series despite the loss of Dawson and Robson, the loss of Lugo has probably turned out to the biggest factor. Lugo was one of the three big bats in the middle of the lineup that drove the offense through most of 2013 for Bluefield, hitting .297/.317/.469 with a team high (shared with three other players) six home runs. His replacement, 17-year-old Franklin Barreto, hasn’t adjusted to the higher level of competition after getting promoted from the Gulf Coast League, hitting just .204/.259/.333. He’s also much more raw in the field as can be seen with 9 errors in just 15 games (Lugo, thought by many to have a future elsewhere on the diamond, had 11 in 51 games). Neither shortstop is known for his patience at the plate, but Lugo only struck out 28 times whereas Barreto has 14 Ks already. Over the course of the season, Bluefield ranked 3rd in the Appalachian League with 4.72 runs scored per game, despite having the lowest average age amongst position players in the league (19.8 years old). For such a young club, the team spread out the power with four players hitting six home runs each: Mitch Nay, Matt Dean, D.J. Davis and Dawel Lugo. The three remaining players of that list will be asked to contribute in a big way in the playoffs. Matt Dean was repeating the level, and after a disappointing first pro season, he has responded to coaching in spades this year. While he still strikes out a lot (second on the team with 57 strikeouts), Dean cut down slightly in August from his July totals and has been absolutely on fire, hitting .396 in August to end up as the Appalachian League batting champ with a .338 average to go with a .390 OBP and .519 SLG. Just from the stats alone, I’d wager that the swing adjustments that he’s been making have taken hold. D.J. Davis came into the season the most raw of the bunch. He still has problems with the strikeout (76 on the year) and, despite his outstanding speed, he still gets caught on the bases a lot (13 SB, 8 CS). There is upside to Davis as can be seen by the fact that he walked 26 times (second on the team) and sported a .323 OBP despite a .240 batting average. Davis is also showing gobs of extra-base power with 8 doubles, 7 triples and 6 home runs this season. If Davis can lay off pitches out of the strike zone (especially breaking balls), he’s going to be a fearsome hitter, but I’m sure the Pulaski pitchers are going to try to get him to chase. Pitching has been the strength of the Bluefield Blue Jays for most of 2013. I had a chance to see several of these pitchers myself back in July (but I missed seeing Labourt and Tirado) and I can say that if the starters are strong, the club will have a good chance of beating Pulaski and advancing. The club was second in the Appalachian League with 3.84 runs per game allowed with the second youngest pitching staff (20.0 years old). Trey Wilson (broadcaster for the Blue Jays) has tweeted that the starting rotation for the 3-game series with Pulaski is going to be Jairo Labourt, Alberto Tirado and Chase DeJong. I’m sure all three will be on strict pitch limits. Jairo Labourt finished the season with some very nice numbers: 1.92 ERA, 1.03 WHIP, 14 walks and 45 strikeouts in 51 2/3 innings. He seems to get the ball hit on the ground a lot and throws in the low-90s (check out Jared Macdonald’s excellent scouting report) with a decent slider and a rarely thrown changeup. I can’t comment on Labourt myself, but from what I’ve heard, he doesn’t have the ceiling that had a lot of people buzzing last year. Game 2 starter will be Alberto Tirado. Again, I didn’t see Tirado myself but people were talking about him. I was told several times that significantly more scouts come out when Tirado was pitching, showing that he’s got an arm that people are interested in seeing. Again, Jared Macdonald got the timing right and wrote up an excellent scouting report. Tirado has been throwing in the mid-90s as an 18-year-old and has an excellent slider. He had a 1.68 ERA and a 1.262 WHIP, showing that he’s struggled more with his control than Labourt has with 20 walks and 44 strikeouts in 48 1/3 innings. Game 3 will have 19 year old Chase DeJong starting. I was very impressed by DeJong when I saw him pitch in July. He throws in the low-90s (but physically looks like he has room to mature) with a devastating curve-ball and a work-in-progress changeup. You can read my scouting report on DeJong. His stats aren’t as eye-popping as either Tirado or Labourt with a 3.05 ERA and 1.214 WHIP but his BABIP at .359 and his strikeouts and walk percentages better than either of them (4.3 BB%, 28.3 K%) shows that DeJong is more polished and could pitch very well at higher level and he is the only one of the three with a FIP lower than his ERA (much lower, at 1.90), showing that a lot of that inflation in his ERA is due to bad luck. Joining the club from the GCL Blue Jays have also been Clinton Hollon, Miguel Castro and Jimmy Cordero. These three will probably not be counted on as much and will most likely be called out of the bullpen. My gut feeling is that Davis, Nay and Dean are going to have to be excellent at the plate and the team is going to have to get some contributions from elsewhere. Who will step up? Jonathan Davis, one of the older players on the team is a candidate, as is Nico Taylor. Tim Locastro has been pretty solid in his first year of pro ball and Jorge Saez has had some very good games. What do you think? 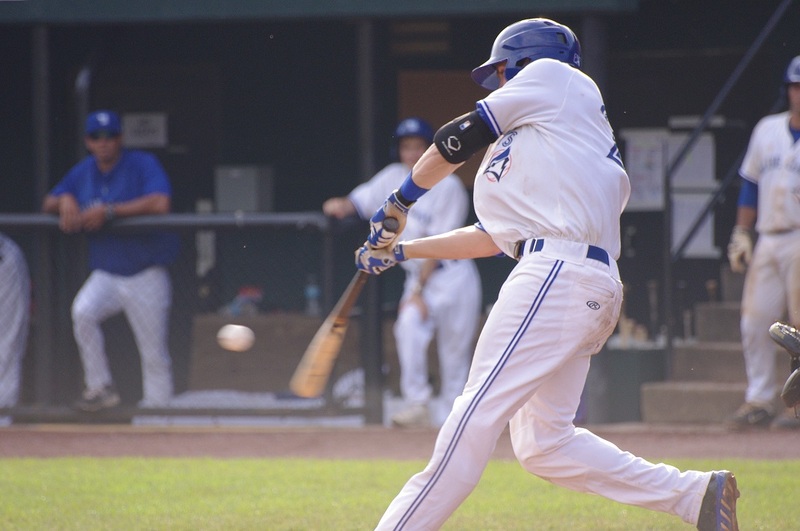 Can the Bluefield Blue Jays overcome their horrible last couple of weeks, right the ship and beat the Pulaski Mariners to get into the second round of the playoffs?